But I, brothers and sisters, could not address you as spiritual people, but as people of the flesh, as infants in Christ. I fed you with milk, not solid food, for you were not ready for it. And even now you are not yet ready, for you are still of the flesh. For while there is jealousy and strife among you, are you not of the flesh and behaving only in a human way? For when one says, “I follow Paul,” and another, “I follow Apollos,” are you not being merely human? What then is Apollos? What is Paul? Servants through whom you believed, as the Lord assigned to each. I planted, Apollos watered, but God gave the growth. So neither he who plants nor he who waters is anything, but only God who gives the growth. Paul returns to hammer home a point he made in Chapter 1: Christian teachers and ministers are servants of God, not elevated figures to lead factions and divisions. Factionalism has no place in a Christian church. For a Christian leader to take credit and pride in the size of his flock is a self contradiction, for it bespeaks the same sinful pride as comes to an atheist who has achieved something in the material world. Our pride in our achievements is always tempered by the fact that we are not responsible for the means to create and sustain anything. We may plant a seed and tend to the plant, but the tomato we grow is not nearly so much our achievement as God's. Paul actually says that we have not achieved anything, and it is easy to see his point, for just as we did not create the soil or the sun or the water, we did not create our own arm that plants the seed. And so, Paul tells us, people who accept Christ but continue to look to other men as the source of their faith are like babies, for they have not fully grasped or accepted the nature of God's will. People are attached to the flesh and it is hard to break bad habits; so Paul might act important, to a degree, while converts are still nursing. But for those who say they follow a certain human being and engage in dividing themselves into groups, they are still acting our of human, not spiritual, motives. Imagine Paul's dismay if he could have watched historical Christianity unfold over the next 2000 years. The people of Corinth were a miniscule forewarning of the religious strife, and the secularization of the church, that has characterized Christianity to this day. It has become so entrenched in society that an Army dog tag will not identify a solider as Christian, but rather as Catholic, Orthodox, or Protestant. Paul reviles this attitude. "Neither he who plants nor he who waters" — meaning the person who converts and the person who leads others in the love and worship of Christ — "is anything." Only God saves souls, and it is only to God that we must give our allegiance. Today's Scripture has become a changing force in Christianity in recent decades. 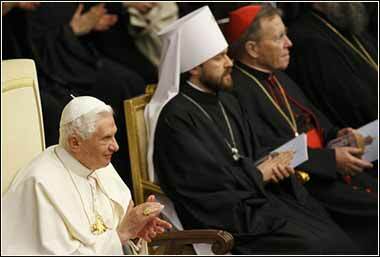 Here, Pope Benedict XVI and Metropolitan Hilarion of Volokolamsk jointly observe the Week of Prayer for Christian Unity in January, 2012. Philippians 4:8 : Finally, brethren, whatsoever things are true, whatsoever things are honest, whatsoever things are just, whatsoever things are pure, whatsoever things are lovely, whatsoever things are of good report; if there be any virtue, and if there be any praise, think on these things.